Friday is shaping up to be another ugly day on Wall Street. 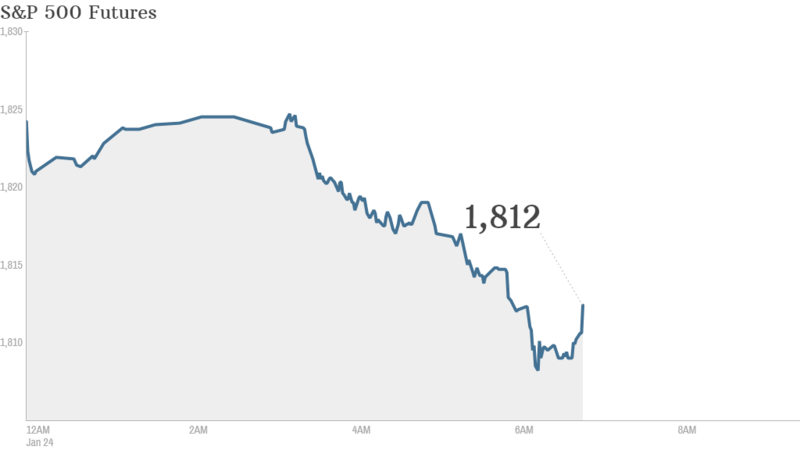 U.S. stock futures were all lower, with the Dow down more than 100 points. Overseas markets were also in the red. Stocks have been off to a rocky start in 2014 while bonds have outperformed. The Dow shed more than 180 points for its third straight decline Thursday, while the S&P 500 and Nasdaq also finished lower. After last year's big rally, investors are looking for signs the economy will be strong enough to keep the bull market going but so far, this earnings season has been less than stellar. 102 S&P 5000 companies have reported fourth-quarter results, with only 66 beating analysts' estimates, according to S&P Capital IQ. Of the remainder, 26 have missed, and 10 have met expectations. More earnings roll in: Xerox (XRX) shares took a dive after the copy machine company reported declines in quarterly revenue and profit. Honeywell (HON) shares rose after the defense contractor reported a slip in quarterly sales but a surge in net income. Procter & Gamble (PG) shares were slight lower after the consumer goods company reported weak quarterly profit. Microsoft (MSFT) shares rose following strong quarterly sales and earnings from the tech giant on Thursday. European markets were all lower morning trading, with benchmark indexes in London, Paris and Frankfurt down more than 1%. Asian markets ended mixed. The Shanghai Composite notched a 0.6% gain, while markets in Hong Kong and Tokyo posted declines of more than 1%, as China's largest bank faces imminent default. Argentina's peso tumbled amid concerns over the country's foreign exchange reserves.